much of the debate this week was in and around TV watching – how it’s changing and what the implications are, especially for brands. I wrote about some of the aspects of this in my post on Friday, but it’s worth dwelling on a point Stew makes at the twenty minute mark around people watching programmes not channels. I think that’s true but I also think its not quite as clean cut as that, and as the CBS / Time Warner stand-off enters it’s second day – leaving 3 million American’s without shows like Hawaii Five-0 (I know) – it’s clear that there is much more to come as the distribution wars heat up. 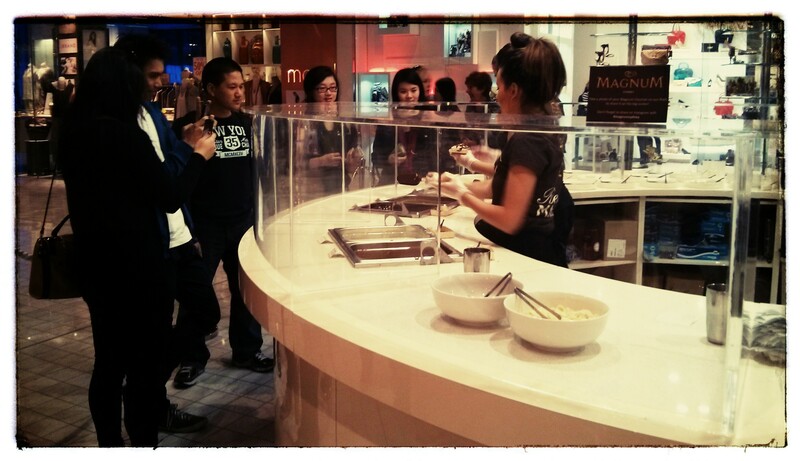 also on the cast we got round to talking about the Magnum Pop-Up Experience hitting Sydney. following the success of the store in other cities, the ground floor of Westfield in Sydney’s CBD has for the last three weeks been the latest place to get the pleasure pop-up. 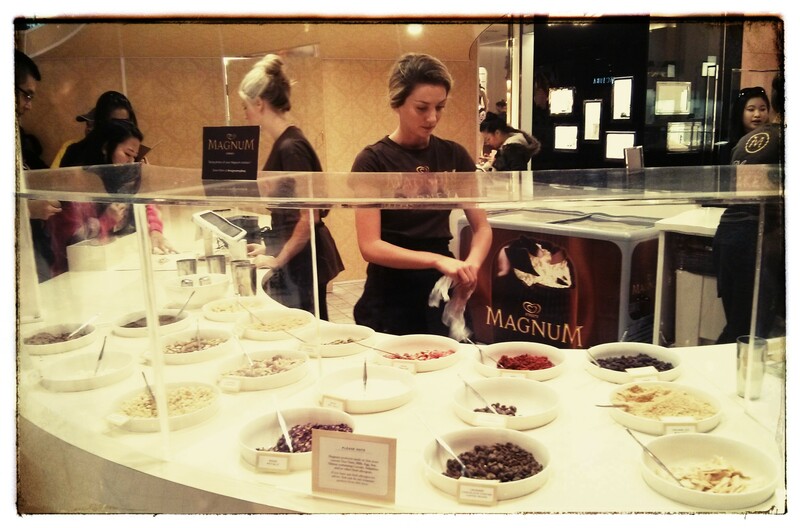 you get to design your own magnum … white, milk or dark chocolate plus plenty of toppings, all for a mere $7. as I say on the cast, it’s a phenomenal example of a brand pulling the trick of landing marketing that gets people to pay for its own existence. 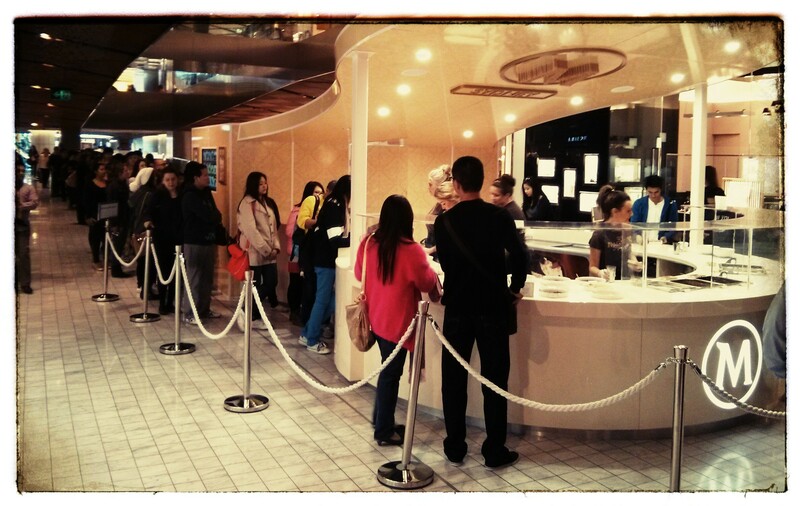 and the fact that people are queuing up for it is proof positive of the indulgence for which the brand is known. ← One Screens to Rule them All: why broadcast TV’s comeback is overplayed and how brand content needs to evolve. fast.